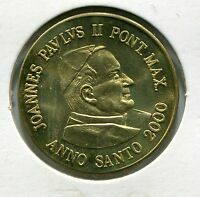 VATICAN CITY POPE JOHN PAUL II 35mm DOLLAR SIZE SILVER MEDAL - AS SHOWN ! Italy 5 lire 1996 UNC RARE! Italy 10 lire 1996 UNC RARE!